Splash pages, you gotta love 'em. A blank canvas where the artist can hit you with a large dose of illustrated 'wow'. 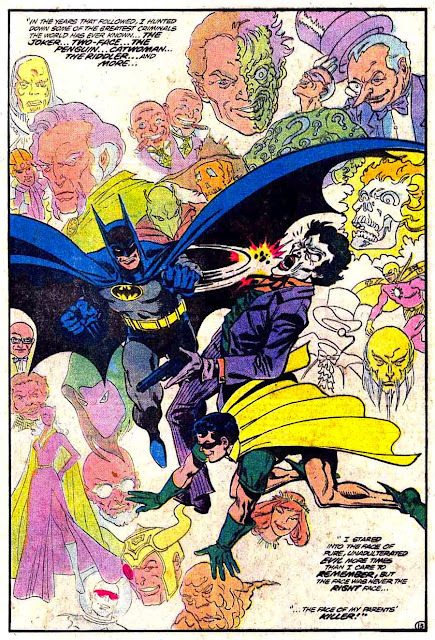 This week, as Bats was top in sales and has had a few other posts to himself this week, I thought I'd post one of John Byrne's first shots at the character, from Untold Legend of The Batman #1, where he's doing that most Batman of Batman things, decking The Joker. While Robin being used as a prop is one of my key gripes over 'old DC', what you really have to love here is the almost watermark effect of Batman's other rouges looking on! Two-Face especially seems to look pretty decent under John's craftmanship. I remember being at my grandmothers for the week end with my cousins. Some other family members had come by and everyone was having a nice time. At some point I went to one of the bed rooms where the kids were doing our thing and opened up a John Bryne's drawn issue of Batman. I spent the rest of the night looking at the art work from beginning to end until it was time for bed. Thanks OA! For me he is the seminal Thing artist, but with a career as long as his you could almost pick any character. His X-Men Early Years [which coincidentally I was re-reading last weekend, for the FF cameoa] and his retread of early Spidey stories...not so much. And he over-egged the pudding with his run on Wonder Woman. His Next Men was imaginative and bold to some, his Doom Patrol turgid. But his early work - Doomsday Plus One, Space 1999, and of course X-Men are masterpieces. And Doomsday is coming back! Im getting his FF Omnibus vol 2 out in December [got the last one]. Man is a legend. And Karl his stint on Avengers West Coast is what really I feel showed Marvel the potential for that team. Plus it unknowingly provided Bendis the springboard for Avengers Disassembled, but was a bit more 'all in the family' and more Avenger-ish in being so. Oh yeah and his stunning Dragon Seed arc in Iron Man, Superman, but the JLA reunion with Chris Claremont... yeah pass on that one. Who is the guy in the splash with the eye patch and the horned helmet?